Casino Euro – Christmas Prize Drop | Week 2! Over 30 players had Lady Luck on their side last week to win one of the randomly dropped Christmas prizes. We are onto week two now with Apple Watches Series 3’s and Beats Headphones as main prizes. Simply spin on the popular Viking Runecraft slot from Play’n GO and cross your fingers that a pop-up message will magically appear with the prize details. 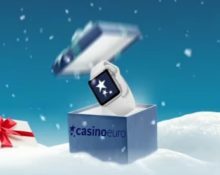 A fabulous Christmas campaign just launched at Casino Euro which will see up to 100 prizes being randomly dropped into players accounts throughout every week until New Year’s Eve. Simply spin on the Game of the Week and you might be the lucky winner of a iPhone X, SoundLink Revolve system, cash and bonus prizes. Any remaining prizes that have not dropped in a week will be raffled off at the end of the entire promotion among all players who played on the promotional games. All cash and bonus prizes will be credited the following business day, latest within 72 hours. Physical prizes can be exchanged for a cash alternative: Apple Watch Series 3 – €300 | Beats by Dr. Dre Headphones – €200. Wagering requirement for the bonus prizes is 10x bonus amount within five days. Wagering requirements with varying game weighting apply, subject to the Casino Euro bonus terms and conditions.